A rich and moving story about how one girl's celestial-sized dreams for a future on Mars go heartbreakingly awry when an unexpected diagnosis threatens her future. Things Mischa "Ish" Love will miss when she goes to Mars: lying on the living room floor watching TV, ice cream, her parrot Buzz Aldrin. Things Ish Love will not miss when she goes to Mars: mosquitoes, heat waves, missing her former best friend Tig. Ish is convinced that she'll be one of the first settlers on Mars. She's applied to-and been rejected from-the Mars Now project forty-seven times, but the mission won't leave for ten years and Ish hasn't given up hope. She also hasn't given up hope that Tig will be her best friend again (not that she'd ever admit that to anyone, least of all herself). When Ish collapses on the first day of seventh grade, she gets a diagnosis that threatens all her future plans. As Ish fights cancer, she dreams in vivid detail about the Martian adventures she's always known she'd have-and makes unexpected discoveries about love, fate, and her place in the vast universe. 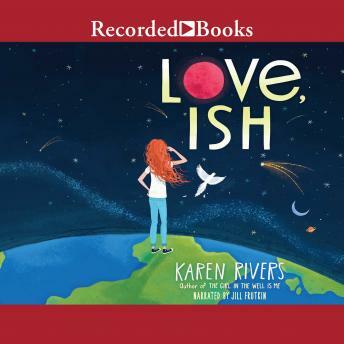 In this story perfect for fans of Fish in a Tree and The Thing About Jellyfish, Karen Rivers has once again created an unforgettable narrator who will pull readers into her orbit and keep them riveted until the very last page.